1. In a mixing bowl , combine flour, brown sugar, cinnamon, baking powder, baking soda, xanthan gum, and salt. 2. 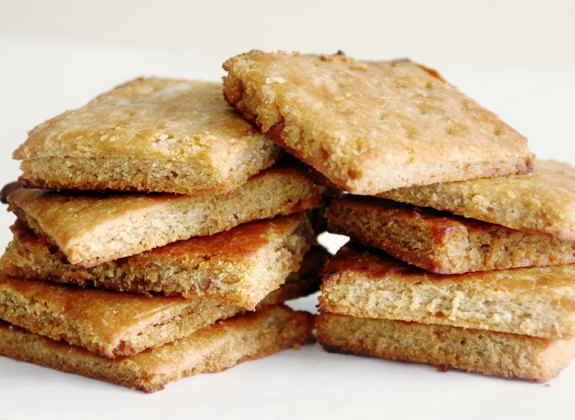 Incorporate butter (or substitute) with a fork until mixture is crumbly. 3. Add in cold water, honey, and vanilla, and stir until soft dough forms. *If dough is too dry, add in water 1 Tbs. at a time until dough forms. Be careful not to go too quickly with additional water because the dough will become sticky quickly. If this happens, just a a few tsp. of flour to even out. 4. 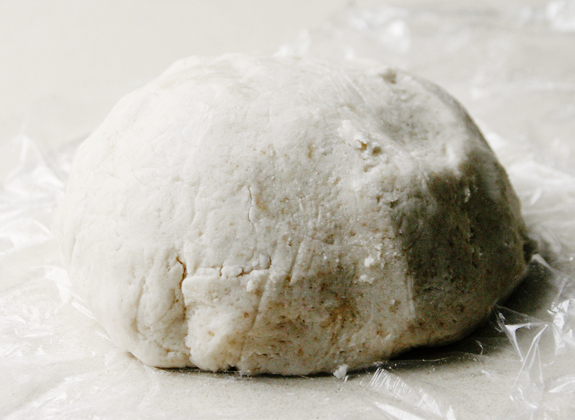 Place dough on plastic wrap and form into ball. Place ball in fridge for 30 minutes. 5. Preheat oven to 325 F. Set aside a baking sheet. 6. Remove dough from fridge, discard plastic wrap, and place dough on a parchment lined cutting board. Cut ball in half. 7. Working with the first half, roll out dough until 1/8" thick (the thinner the better). With a knife (or pizza cutter) cut 2" x 3" pieces (each dough half will yield about 12 single crackers). Prick with fork to create the famous graham cracker wholes. 8. 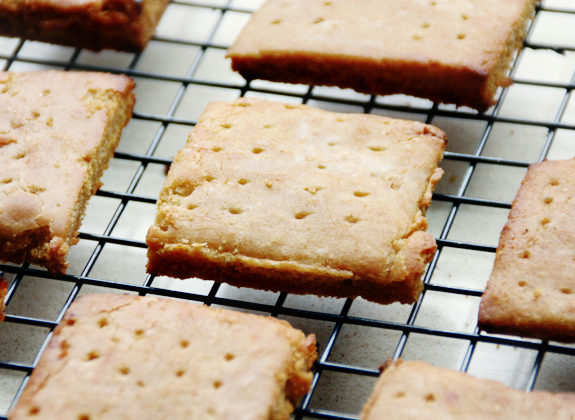 Transfer crackers with parchment to your baking sheet. 9. Bake for 13-15 minutes, or until a deep golden brown. Repeat steps 6-9 for second half of dough. © 2008-2014 Brunch at Saks. All Rights Reserved.